Rolling thunderstorms of summer are happening on a regular basis now. The days are hot, sunny and humid until clouds gather and a quick, intense thunderstorm happens. During the hot and sunny times we hose the pigs down. They get hosed off during the thunderstorms too, but it seems like by midday all of that water has dried up. 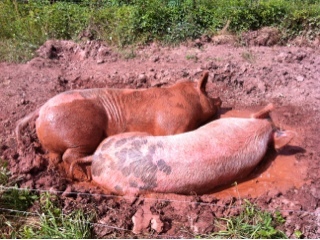 The pigs love to make themselves a coat of mud. They are making a cool coat of clay on themselves. Pottery pork.